Tonnarelli is the Roman name for the pasta you may know by its more popular Abruzzese name, spaghetti alla chitarra. It is a fresh pasta that looks like square spaghetti. In Rome, this pasta is sold in any supermarket but elsewhere, you may find you have to make it yourself. Due to its thickness (and the optional use of semolina flour), homemade tonnarelli provides quite a bit more ‘bite’ than your average fresh pasta. And that’s good thing for robust Abruzzese sauces or the typical Roman treatment, cacio e pepe. 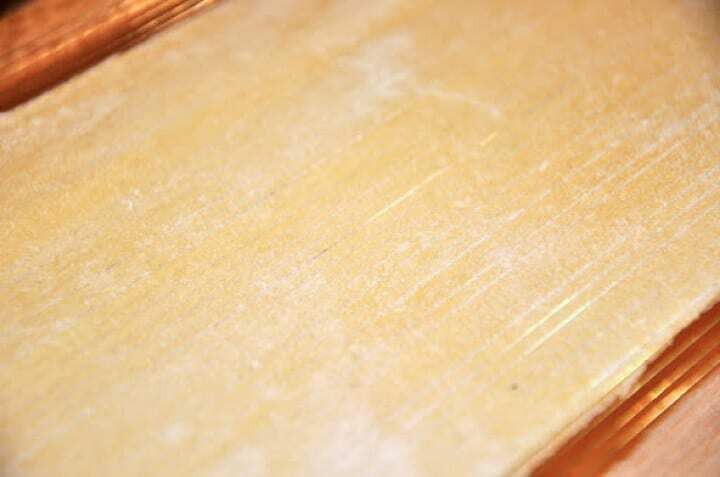 The guitar is fitted with wire ‘string’s top and bottom that are used to cut the pasta. The strings are narrowly spaced on one side, and widely spaced on the other. For tonnarelli, you want to use the side with the narrowly spaced strings. 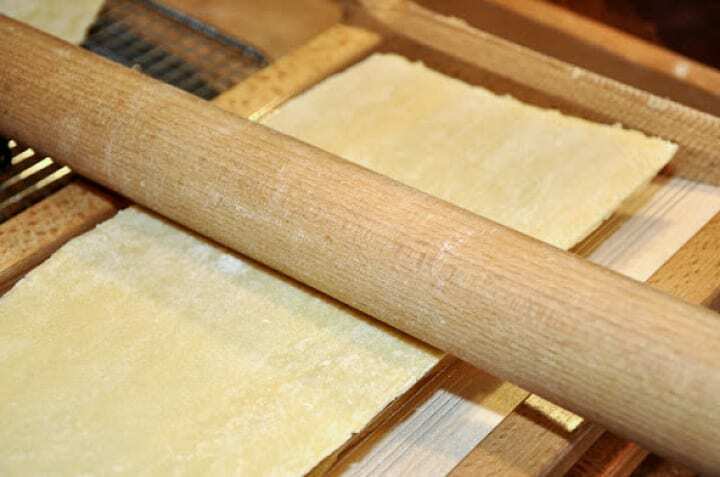 To begin, make some fresh pasta dough in the usual way—adding just a tablespoon or two of semolina flour per egg if you like for extra ‘bite’—and roll it out quite thick. The pasta should be as thick as it is wide, so you can be guided by the strings of your ‘guitar’. (Using a KitchenAid mixer attachment, use Setting 1 or 2.) Let the pasta sheets dry out for a good while (at least 20 minutes) so they will not stick too much as they are cut by the guitar. Cut your pasta into sheets about as long as the chitarra, leaving some room on each end for the pasta to stretch out, which it will as you proceed. 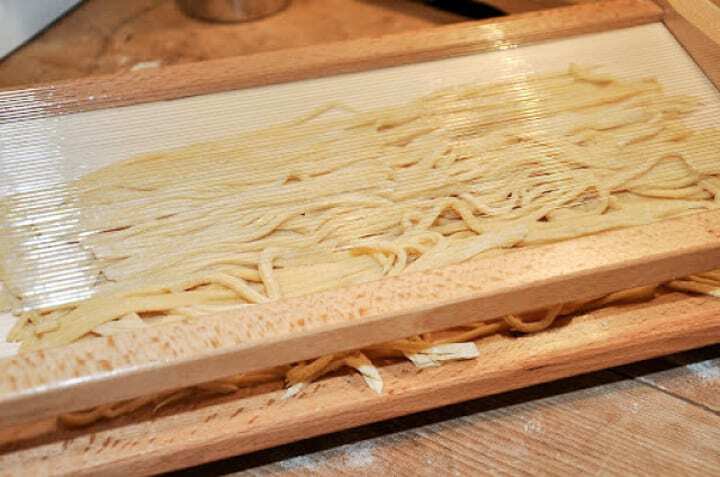 Slide the tonnarelli out of the chitarra and lay them out to dry on a wooden board or towel. Repeat the operation with each additional pasta sheet. (NB: Depending on how dry the pasta sheets are, you may need to separately some of the strands by hand.) 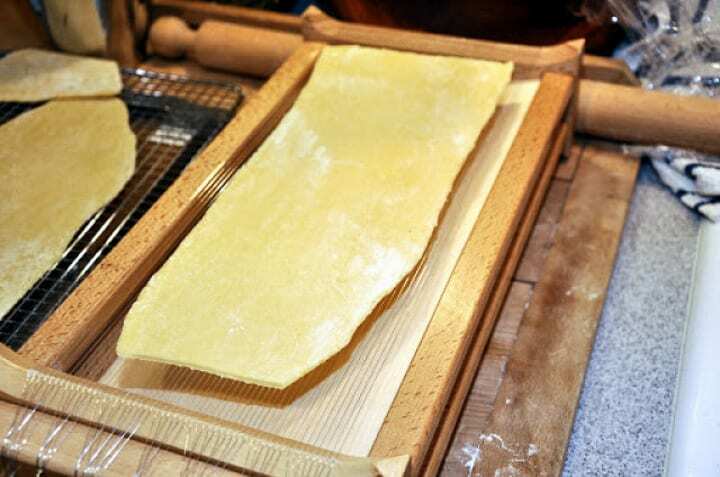 Due to its thickness, homemade tonnarelli take a bit longer to cook than other kinds of fresh pasta, as long as 5 minutes or more depending on how long it has been drying. Homemade tonnarelli are sometimes made exclusively with hard durum wheat flour (semolina) and sometimes just with “00” flour, which changes the character of the pasta considerably. I prefer neither ‘extreme’ and use mostly “00” (or simply all-purpose) flour with just a spoonful of semolina. Besides their use in the Roman classic cacio e pepe, in the cooking of Abruzzo, spaghetti alla chitarra (as tonnarelli are called there) are typically dressed with a lamb-based ragù. Tonnarelli are also very good with shellfish sauces. Indeed, they are extremely versatile and lend themselves to all sorts of sauces and condiments. De Cecco makes a dry pasta version of spaghetti alla chitarra, which is available through amazon.com. I have not tried it, but I have to imagine that the dry version, while surely good, will not give the same results as the fresh homemade tonnarelli. Thanks, folks, for all the kind comments. 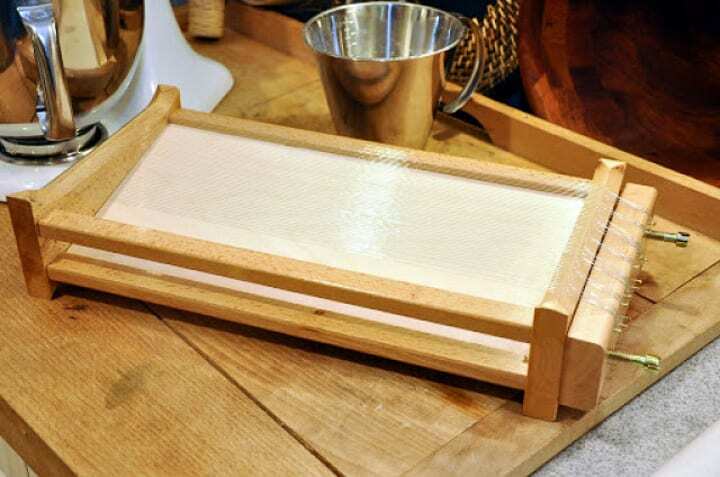 And yes, this has got to be one of the easiest ways to make fresh pasta at home. The best part is that a chitarra is actually very reasonably priced, too! @Evie, To be honest, I've never made (whole)wheat pasta, but my take would be that you would still have to include white flour, say at a 1:1 ratio, to ensure proper texture. That is so interesting. I had never seen a chitarra. I bet the homemade pasta with the simple sauce was heavenly. Tips for making this with wheat pasta since wheat pasta varies in texture? Thank you! looks amazing. what a cool way to make pasta!!! it sure beats cutting it by hand too! I love pasta with pepper and cheese, my wife had never had it, and I finally got her into eating it this way…one of my favorites for sure! A nice, creamy paste like this would be my shot if I would ask for ideas on what to put on the dinner table tonight. Beautiful! “da leccarsi i baffi” (which means: you could lick your mustash!). These are a wonderful old Roman dish. Boni. The chittara looks like a fun thing to have in the kitchen! Oh…I've been considering buying a chittara. It looks so cool and makes preparing pasta so easy. 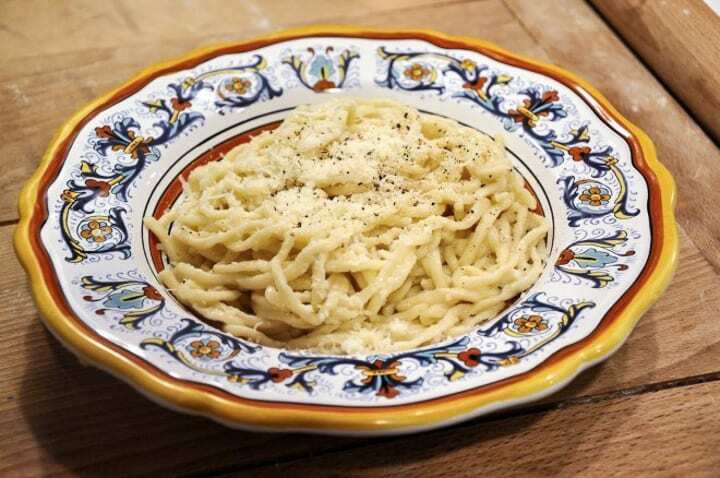 Your cacio e pepe sounds good, perfect for a busy weeknight. What fun to have a chitarra for this quintessential Roman meal. I love variations on this – it was the first thing my children leanred to make in grade school. (Alrhough they shredded Parmesan on it). And we of course do the galic and olive oil/red pepper/garlic combo. My grandmother had so many things for making pasta – and sadlty someone tossed it all after she died. Oh how I wish I had all of it! I would love to be eating at your table. This is one of my grandmom's favorite ways…just lots of cheese and a ton of freshly cracked pepper…omg I love this dish! Havent made it in a long time or thought about it, grandma's been gone since 1975, and this just brought back wonderful memories…got to do this soon! thanks Frank ! Since I'd probably mess this up, I'd much rather eat at your table!